Don't Mix Business and Pleasure. That Includes Your Bank Accounts. I have to admit. I was not a fan of business accounts. I thought it was just another way for the banking institutions to get more of our money in different accounts. So, I didn't use one for a long time. And just made sure that I kept a record of my business expenses. And then I realized how easy it is to mix them up . And how important it actually is to have separate homes for your personal and business monies. If for nothing else, for peace of mind. As business owners, we hear a million times from the accounting gurus. Separate your business transactions from your personal expenses. Don't co-mingle your expenses and open a business account. But, does anyone even know why? Does it really matter which credit card you use if you remember to claim the business transactions at the end of the year. And will the IRS really come after you to check that you have a separate business account? Or is this all just a scam for the banking institutions to get more of our monies by getting us to open up more accounts through them? Who knows. It may all be a conspiracy by the IRS and the bailed out banks to get you to open up another account and apply for another credit card. But, here's the real reason why you should separate your expenses and why it should be the very first step you take in getting your books in order. Wealth is attracted to clarity and organization. The fastest, and simplest, way to do that is to cut out the clutter and separate your biz and personal accounts. Easily track your expenses. Did you enroll in 24 online courses last month? Right. Quickly set income goals. How much did you actually make last month and the 3 months before that? Gearing up for your next launch? This will help you budget a little easier this time around. You'll feel like a BOSS. It's true, you will. Enough said. I know that you take your business seriously and the days of treating it like a hobby are long gone. But, if you're ready to take it to the next level- and regardless of how much you make, there's always another level to strive for- having a clear idea of your current business expenses and income will work magic. You'll instinctively know what's worth investing your money into and what's not. Do you need to open a specific "business" account? No. This account can be through your local credit union or an online program. The only thing that matters is that your business transactions are not having an affair with your personal side. Will you slip and mix up your transactions from time to time? Sure we all do. Bookkeeping is like anything else in your life. It's a practice. Don't judge it, just make an effort to recognize your habits and gently make adjustments. So, pinky promise that after you read this article you'll designate or open an account just for your business stuff? When I first launched my cloud bookkeeping business, the first thing I did was write up a business plan with the hopes of securing a loan. Clearly I kinda dig numbers and spent a lot of time figuring out how much I actually needed without going over board. I came up with a modest figure of $5,000 and immediately started researching who was going to fund my next big idea. Looking back on it, there were some key questions that I should have asked myself before searching for debt. And I probably would've ended up not needing one. If you're thinking about getting a loan to fund your next fabulous launch or whipping out your credit card to buy that fancy camera equipment, definitely keep on reading! 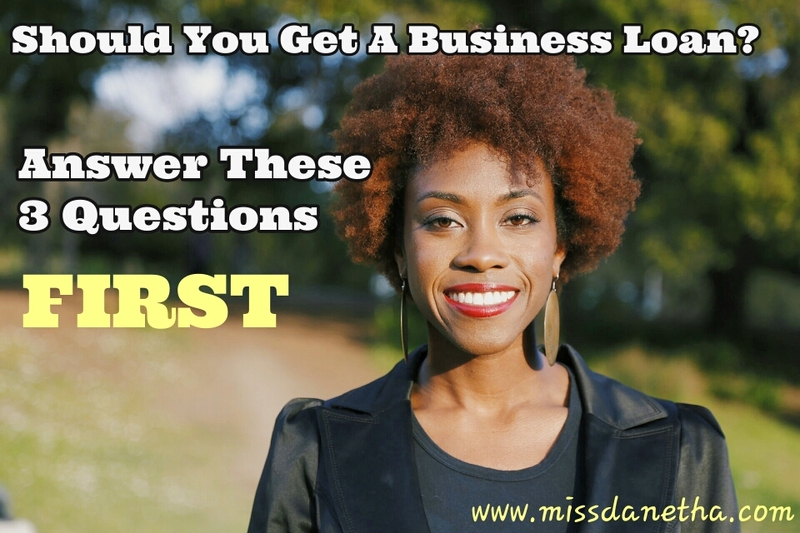 Answer the three questions below before run up the debt in your business. Whether or not to use debt to fund your business is a big decision, especially if you feel like you can't get started because you don't have the money to do so. I found a program that funded young entrepreneurs and got my $5,000. Which was awesome! Not just to get the money, but what I learned along the way. But, there were definitely some drawbacks to it as well. My business plan was critiqued several times by different professionals and it forced me to do more research. I had to present my plan to a board which showed me how to effectively communicate my service. I met a great group of people who have served as mentors to me, became clients or referred clients to me. I started my company in debt. I didn't learn how to bootstrap my company and find creative ways to do things for free. Did I mention I started my company in debt. In other words, with every dollar I made, a portion of that had to be paid back. While there are definitely great benefits to getting a loan, in hindsight I should have waited to apply for a loan and probably wouldn't have ended up not needing one. And my advice to anyone now is to not take out a loan or use your credit card unless you are absolutely certain that you need it. Why? Because it forces you to bootstrap, you aren't in debt and you'll have a better idea of what the money will be best used for. So, if you're thinking about racking up some debt to fund your dream, ask yourself these three questions before you run out and get a loan and post it in the comments below. Do you have a clear plan for the money? Have you exhausted every other free option? Have you made your first dollar doing this new idea? If you answer "No" to any of these questions, do yourself a favor and don't use debt.